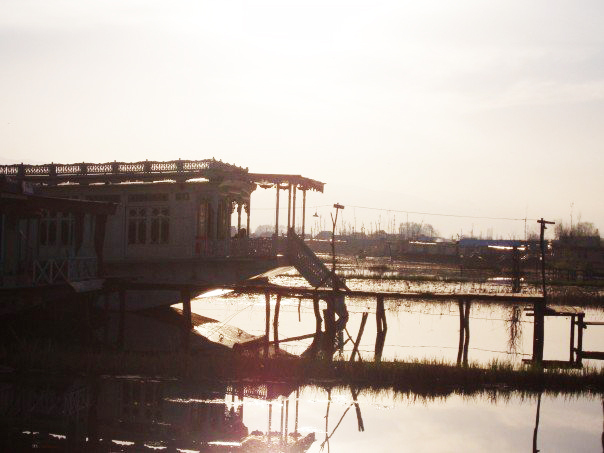 At the moment I’m reading The Kashmir Shawl by Rosie Thomas, and it’s making me wistful about my stay on Dal Lake. One of my resounding memories was of the saffron sellers who drifted round the houseboats, explaining the subtle differences of their wares—trying to pedal their most expensive, deep red crocus stigmas. Like a wine connoisseur they discussed the appearance, aroma and how the saffron reacted with water. There’s a lot to learn about this spice —after all, it’s more expensive than gold…but for the time being, I’m having to make do with a £3.50 pot from Tesco’s. If you’re in a frivolous mood, then buy a pot too. 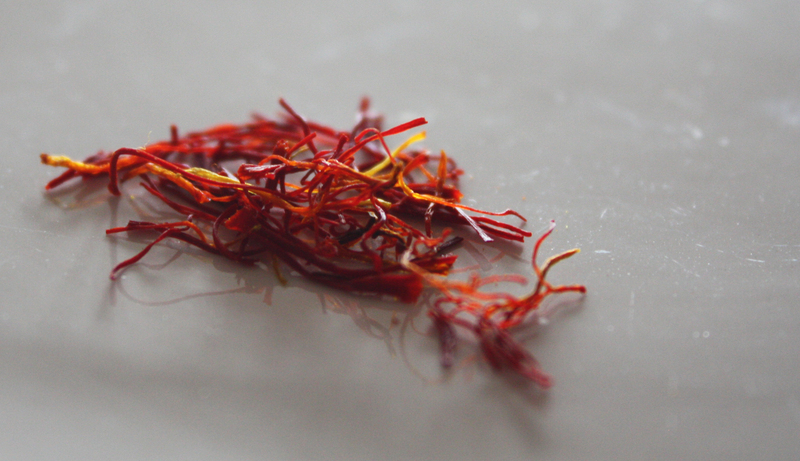 You might feel a bit sad when you see how little saffron you’re getting for your money, but a small bit goes a long way – and it’s a fun thing to use to spice up a risotto, mussel dish or a tagine. I came across this saffron potato recipe when I was cooking for a family a couple of summers ago. I seem to remember that it was from a cook book called ‘Diva’ which made me giggle – clearly divas can’t eat normal potatoes, they aren’t glamorous enough! This is a great recipe for lots of different reasons though. Firstly, it’s the tastiest potato recipe I’ve ever come across. But it’s also a nice way of adding another colour to a plate, and it’s a super summer-alternative to standard, Sunday roast potatoes. Firstly, pour the boiling water in the bottom of a jug and add the pinch of saffron. Leave to infuse for 5 minutes. Add the zest of 1 lemon, and juice of 2 lemons to the yellow saffron water. Cut the butter into cubes, then add that as well as the olive oil and rosemary. 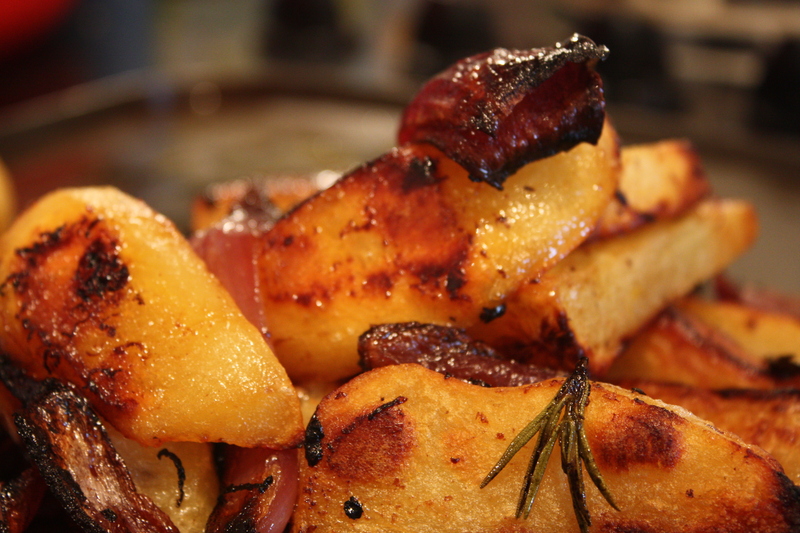 Peel the potatoes, and cut them into wedges. Cut the red onions into similar shapes. Put them in a roasting tray, and then pour everything from the jug over them. Toss a little, and put into an oven at 180C for 50 minutes. Turn the potatoes a couple of times during cooking. 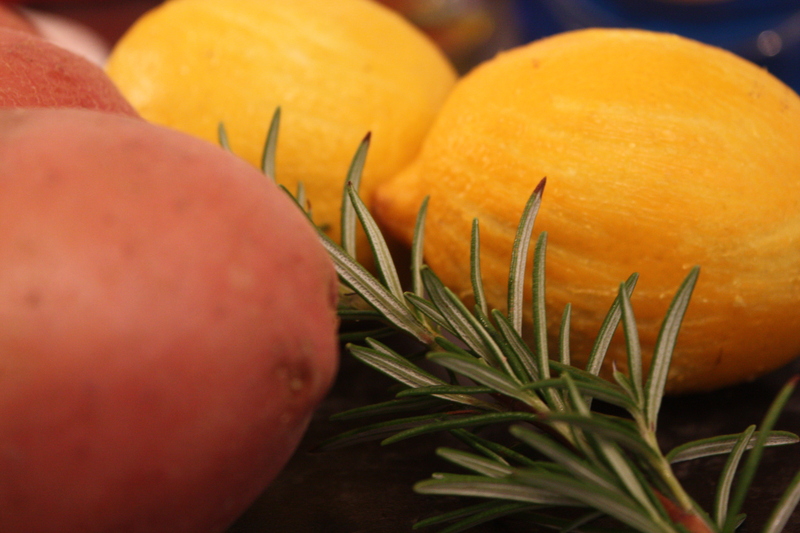 The finished result should be deliciously glazed, deep yellow potatoes which enhance any meat or fish dish. This recipe looks lovely….simple and showing how a basic food can be taken into another sphere…I have saffron bought during my travels….enjoyed lovely “saffron potatoes” in Tunisia recently…and with gorgeous Sea Bass in Cannes last year. Having been cooking for almost 35 years it’s always lovely to discover another way to present everyday ingredients. Will return with my tasting comments!